This year's National Maritime Heritage Grant recipients have been announced! Please visit our Recipient List for details. Important: currently, there are no plans to open a new grant cycle until further notice. Please check our website and social media accounts for updates, or contact program staff. Details and application procedures can be found on our application page. Continue reading below to learn about the history of the National Maritime Heritage Grants Program. 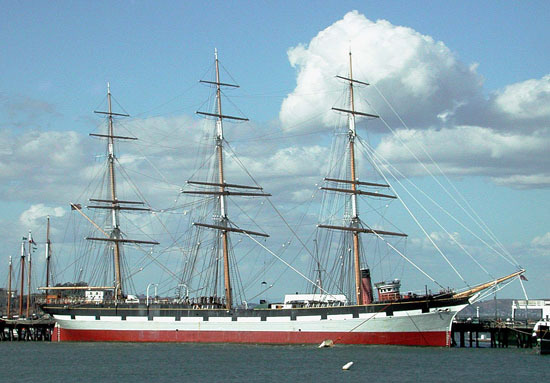 1998 grant recipient Balclutha moored along Hyde Street Pier in San Francisco, California. Photograph from San Francisco Maritime National Historical Park. On November 2, 1994, the National Maritime Heritage Act (H.R. 3059) became Public Law 103-451 (54 USC 308701-380707). It states a National Maritime Heritage Policy and establishes the National Maritime Heritage Grants Program within the Department of the Interior. The Grants Program is administered by the National Maritime Heritage Program (NMHP) of the National Park Service in partnership with the Maritime Administration (MarAd). It provides funding for education and preservation projects designed to preserve historic maritime resources and to increase public awareness and appreciation for the maritime heritage of the United States. The grant is funded through a percentage of the proceeds from the sale or scrapping of obsolete vessels of the National Defense Reserve Fleet (NDRF). All grants awarded must be matched on a 1-to-1 basis with non-Federal assets. One round of grants was awarded in 1998. Unfortunately, due to environmental and worker safety issues associated with the grant funding source, the popular program was discontinued until 2014 after this first round. Successful projects from the 1998 and 2014 grant cycles can be found on our recipient list. In 2013, the NPS and MarAd entered into a Memorandum of Agreement (MOA) that established a partnership to promote and advance public awareness and appreciation for the nation?s maritime heritage, including re-establishment of the grants. MarAd sales of obsolete ships will continue to provide annual grant funding at approximately this same level over the next four years; MarAd and the NPS anticipate that if sales continue at or near current levels, the program can continue to support maritime heritage projects across the country for the foreseeable future.